The all new V9000 Seismograph is designed and manufactured by Vibrock Ltd to meet the needs of our customers. 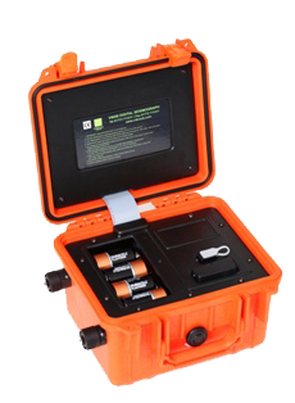 The V9000 Seismograph is a battery powered portable vibration monitor, designed for monitoring blasting, piling, demolition, construction and traffic vibrations. It can also monitor dominant frequencies as well as air overpressure from blasting, using the optional microphone. New features include internet based remote capability, frequency plotting in accordance with BS 5228 Part 2: 2009 and BS 7385 Part 2; 1993, multiple text alarm functions, larger screen with graphical representation, 7 day timer function, sleep mode, basic and custom set up, selectable data storage rate, data storage for all 3 axes, and extended battery life of up to 40 days. Results can be downloaded to a PC, using Vibrocks all new plug and play software, and can be saved, analysed, printed and exported to Microsoft Excel. The V9000 Seismograph is also available as a twin channel transducer instrument enabling measurements on a common time base in two locations simultaneously. The V9000 Seismograph also measures vibration dose value (VDV) to BS 6472 Part 1:2008. Don’t hesitiate to contact us for more information!